The Cheesecake Factory Bear, 14" tall. SACAGAWEA cloth doll from Hallmark "American Spirit Collection". 2000 - doll only. Beautiful Russian porcelain Cone doll in Folk costume. Vintage souvenir Italian doll, mis. cm 12 CARLA. Raggedy Ann and Andy picture frame from Life Echoes 6 X 4". The Peanuts toys Charlie and Lucy Happy Meal toy, 2015. Raggedy Andy knickerbocker green pants vintage stuffed doll. Pillow doll top for crochet pattern from Fiber-Craft 1988. 1996 Hasbro Raggedy Ann Ragdoll. Doll by Pauline B Jonness - Ingrid. Vintage hard plastic body doll with rubber head, 14 inches tall. 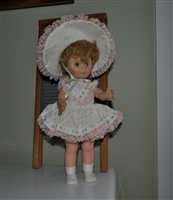 Heirloom Treasures porcelain doll by Accents & Occasions, 9" tall. 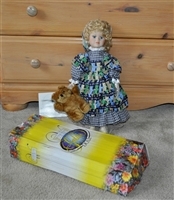 Wyndham Lane Porcelain Goldie doll with COA. Mattel Barbie Doll, 1966, crocheted dress. Vintage rubber body and hard plastic face traditional costume dressed 7-3/4" doll. Berta Hummel 2001 Goebel soft body doll. South American Folk Art handmade ragdoll holding babies in hemp fabric colorful dress. Effanbee Gumdrop 16" tall doll, 1962. Tuong performer vintage Vietnamese doll with painted face mask and ornate yellow clothing. Vintage Composition Mexico Cultural and Ethic doll tourist souvenir. Vintage sleepy eye hard plastic 8 inch doll with red hair. Vintage Sleepy Eyes groom doll moving arms in original clothing. Mattel 1964 vintage doll 18" Baby First Step no batteries, for parts or repair. Nintendo Super Mario Brothers 13" plush toy. Ronald McDonald collectible toy RONALD articulated doll, 1976 McDonald Remco toy. Horsman doll 1971, drink and wet, 16" tall. Happy Birthday Barbie doll with tiara, box included. Dream World doll from 1940s.